Do you think you could go more than twenty years without touching another person? Without feeling the simplest display of comfort, a consolation, a hug, a brushed kiss on the forehead? Due to a rare genetic mutation, Jubilee isn’t able to experience even the slightest touch of another person, without risk of death. After a nine-year self-imposed exile, her fear of being touched reaches far past her own health concerns and has morphed into agoraphobia and severe social anxiety. Tragedy forces Jubilee out into the real world, sending her on a path she could have never imagined and into the lives of Eric and his adopted son Aja, each with their own set of complicated problems. What follows is emotional journey of healing, acceptance, and yes, even love. Jubilee is a character that I wasn’t so sure about at first. But ultimately, I loved Jubilee and all her eccentricities. I think there is a little bit of Jubilee in all of us—call it fear of the unknown, fear of not being accepted, or the feeling of otherness that creeps in. Her character is universally relatable and that was what made her character arc so captivating. Eric is a recent divorcé who’s trying to come to grips with the unfortunate direction his own life has taken. His daughter Ellie who lives with his ex-wife in New Hampshire hasn’t spoken to him in months. And his best friend and wife died tragically in a plane crash, leaving their son Aja in his care. Aja isn’t like other kids, unusually intelligent and perceptive for his aged and fixated on telekinesis and what Eric perceives as delusions. I love the types of stories where two people are living life, meet each other, and sort of stumble-fall in love when they least expect it. Close Enough to Touch is that type of love story. The romance in this story is a slow burn—which I LOVED—as Jubilee acclimates to the outside world and Eric struggles to find his footing with his own problems. There were so many moments between Eric and Jubilee that felt so real and pregnant with raw emotion. The ending of the book left me with so many feelings, mostly of hope and possibilities. Due to Jubilee’s long-term social isolation there were a lot of logistical things that had to be explained away quickly in the beginning for believability, like how she got money to paid bills, what happened if something in the house broke down, how she got groceries, etc. I’m still not convinced that in the nine years she was in the house she didn’t ever get sick enough to warrant a doctor or hospital visit. Admittedly, I had difficulty believing that someone who didn’t leave her house for nine years could transition back into society as quickly as Jubilee did. That’s not to say that the author didn’t put her anxieties on full display—she did—but I did think that plot line needed to be explored and delved into a little bit more. In the beginning, the nine-year exile ended up being more of an obstacle to the plot, rather than something that was completely necessary for Jubilee’s character. Having a genetic disorder and fear of coming into contact with people would naturally be enough to cause you to isolate and not have friends. I was able to suspend whatever disbelief I did have because I enjoyed the characters and their journeys so much. Colleen Oakley is an author I will read time and time again. Her ability to create a strong bond between the reader and the character is one of her strengths as a writer. I’m a reader who always tends to read for character and prose over plot, and it was my emotional connection to Eric, Jubilee and Aja that drew me into this story until the end. The story’s central message was a heartwarming one about overcoming your fears, self-acceptance, and allowing yourself to love and be loved. Despite some of my issues, I still highly recommend this one! * Thank you to Gallery Books for providing me with an early copy for review. 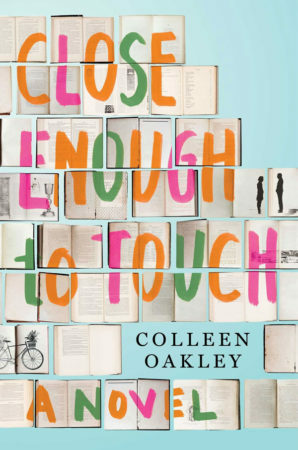 Colleen Oakley is going on a book tour very soon! See if she’s coming to a city near YOU!